In 1904, the British government ordered an inquiry, into the possibility of Britain becoming involved in a major world war. In the event of a world war, Britain would dominate the seas, and Germany would dominate the land warfare, with Russia providing the same number of soldiers, but being less efficient and professional than the Imperial German army. 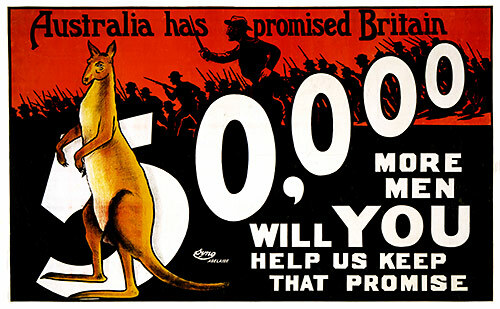 Australia pledged that it would fight in this war to support Britain. Canada, with the vast majority of its population being British born, or descended from British migrants, stated that it would be ready to defend the British Empire. The population of these countries still described Britain, as home. The major trading partner for these countries was Britain, with serious political consequences, if these countries did not support Britain. The same would apply to other British colonies, like New Zealand, the Caribbean and African countries. 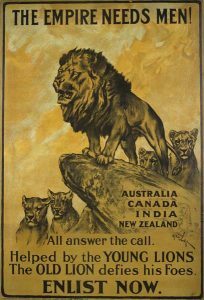 As a consequence, 5 million British, 1 million Indian and a further 1 million from Australia, New Zealand and Canada volunteered to join Britain in its fight. The South Africans quickly captured S.W. Africa, but struggled in Tanzanika. New Zealand and Australia capture the German Pacific colonies, with Japanese help. During the 1st World War, the allied shipping lanes are threatened by German U-Boats. Australia and New Zealand’s’ economy shrinks by 10%. With Australia unable to export its wheat, Britain guarantees to buy Australian wheat harvests, with the consequence, that this act stabilizes the Australian economy. Canada manages to export its wheat to the USA. A 1/3 of the artillery shells used by the BEF, were manufactured in Canada. Countries which have landed borders, have conscription, for example, Germany and France, with countries, that are surrounded by water, like the United Kingdom, have only volunteer armed forces. New Zealand introduces conscription, with a consequence that 50%of the male population are serving in the armed forces, with severe consequences for New Zealand’s economy. Canada also introduces conscription, but there are plenty of exceptions, including the farmers, and the French speaking Quebecois. Australia votes to reject conscription, and in November 1917, conscription is again rejected. One of the consequences of the rejection of conscription is that no Australian is executed for desertion. Conscription is not enforced in Ireland, and it is the same in South Africa, to ensure that trouble does not break out by the Boers. Britain lost 705,000 out of a population of 45 million, with Canada losing 458, 000 out of a population of 8 million, Australia losing 332, 000 out of a population of 5 million, and South Africa losing 136, 000 out of a population of 1.4 million. The first major action for the troops of Australia and New Zealand was Gallipoli, where they earned a great reputation, with the Canadians winning great fame by their capture of Vimy Ridge. Britain asked their colonies to stand by Britain, during the war, and all the colonies finished the war, with their reputations enhanced. The reason why the Britain’s Colonial armies did so well is that their officers are recruited from the technical middle class, who had been trained in their previous civilian life to use their initiative. This also applies, but much later on, with the British armies. The countries believed that their contribution and sacrifice should be rewarded, by becoming nations in their own rights, and should be fully rewarded, by being fully involved in the peace negotiations. King George V signed the Treaty of Versailles, representing the British Empire, as an entity. India does not achieve self-governing status, as promised to India, at the beginning of the war. This leads to a rise in Indian nationalism. Ireland, also does not gain self-governing status, which leads to independence in 1922. Australia does gain any repatriations, from the peace treaty, as the country had not suffered any damage from the Germans, but was rewarded with the Pacific Island of Naru, Soma and New Guinea. As a result of the contribution made by the British colonies, there was a gradual movement from Empire to Commonwealth. For details of full membership of the Historical Association, please telephone Association Headquarters on 020 7735 3901, email: enquiry@history.org.uk or visit their website. See Membership page for details of local membership.